Review posted August 1, 2014. My son sent this book to me, and I love it so much. I love his words in the note that accompanied it: "Dear Sugar is... the sort of creature I am startled and pleased to find existing in the world. Like a Mister Rogers of heartbreak and anguish." 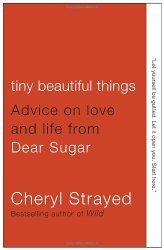 But Sugar (Cheryl Strayed) handles them all with so much grace! She relates things back to her own difficult life experiences and has much humble, practical wisdom to share. And all along, she addresses people with endearments and makes them feel like they're okay. I'm going to give some random quotations from her advice below. Perhaps it will give you the sweet flavor. It's going to be difficult, but that's no surprise. The story of human intimacy is one of constantly allowing ourselves to see those we love most deeply in a new, more fractured light. Look hard. Risk that. Be brave. Be authentic. Practice saying the word "love" to the people you love so when it matters the most to say it, you will. Trust yourself. It's Sugar's golden rule. Trusting yourself means living out what you already know to be true. Writing is hard for every last one of us -- straight white men included. Coal mining is harder. Do you think miners stand around all day talking about how hard it is to mine for coal? They do not. They simply dig. I have breathed my way through so many people I felt wronged by; through so many situations I couldn't change. Sometimes while doing this I have breathed in acceptance and breathed out love. Sometimes I've breathed in gratitude and out forgiveness. Sometimes I haven't been able to muster anything beyond the breath itself, my mind forced blank with nothing but the desire to be free of sorrow and rage. What's important is that you make the leap. Jump high and hard with intention and heart. Pay no mind to the vision the commission made up. It's up to you to make your life. Take what you have and stack it up like a tower of teetering blocks. Build your dream around that. As you are surely aware, forgiveness doesn't mean you let the forgiven stomp all over you once again. Forgiveness means you've found a way forward that acknowledges harm done and hurt caused without letting either your anger or your pain rule your life or define your relationship with the one who did you wrong. Sometimes those we forgive change their behavior to the extent that we can eventually be as close to them as we were before (or even closer). Sometimes those we forgive continue being the jackasses that they always were and we accept them while keeping them approximately three thousand miles away from our wedding receptions. I'll never know, and neither will you of the life you don't choose. We'll only know that whatever that sister life was, it was important and beautiful and not ours. It was the ghost ship that didn't carry us. There's nothing to do but salute it from the shore. Isn't love amazing that way? How it can bend with us through the years? It has to. It must. Lest it break.